United States," Warner & Beers Publishers, Chicago, 1875. 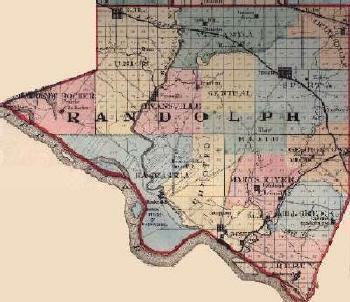 Randolph County of Randolph County was a big coal mining area, especially in the northeast between Sparta and Coulterville. For more information on coal mines in Randolph County, check out the Illinois State Geological Survey report. Randolph County of "While the Salina Journal named Colonel and Mrs. Phillips and their children as the "first family," Sparta, Illinois claimed all the honor for Salina's start. Each year the tribe of Sparta grew larger and larger. … When we look over the families who settled here and helped with the building of the city, Sparta -- Little Egypt -- may well be proud of its role in giving Salina a place in history. There were all the Phillips clan, Alexander Campbell, the Muir family, Alexander Spilman, B.J.F. Hanna, the Addisons, several branches of the Morrison families, the Beans, Robert Craig, A.L. Wilson, Henry Allen, Robert Dickey, W.C. Tuthill, Samuel Strickler, Robert J. Gemmill and Robert and Mac Stevenson." [S56] Book, City on the Move , page 179.